Dolphin became the default file manager when KDE went to 4.0, so Kubuntu users already know what a great program it is (unless they preferred to stick with the previous default file manager, Konqueror). While Ubuntu‘s desktop environment, Gnome, has certainly stepped up of late when it comes to visual effects, screenlets and the like, KDE has always been about “bells and whistles”. 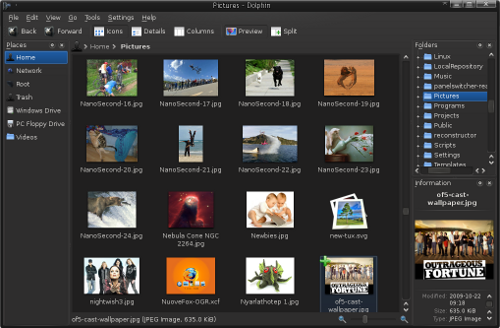 And while Gnome can end up looking pretty stunning, the same can’t be said about its default file manager, Nautilus, which is about as plain as they come. 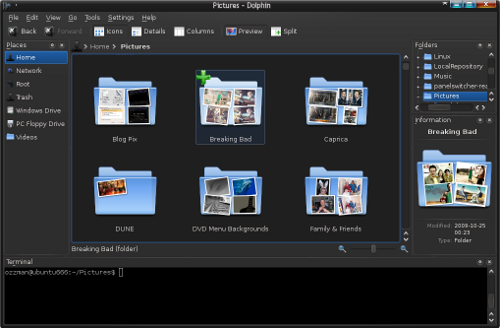 Dolphin, on the other hand, has the little niceties one would expect of a KDE file manager, like animated folder icons, and a lot more. There is an easy to access zoom slider for thumbnails, and has some pretty unique “views”. You can customise it in ways you could only dream of in Nautilus or Thunar, like not only add extra panes, but also move them where you like, and resize them to your needs. If you look at the above pic, you’ll see that you can add a Folders (“tree”) pane and put it above the Information pane on the right (you could put it under Places, of course, but why not save that for shortcuts). Also, you can add a Terminal to the bottom, so whatever folder you’re in, you can just type commands without having to open a terminal in each folder (or continually change paths). 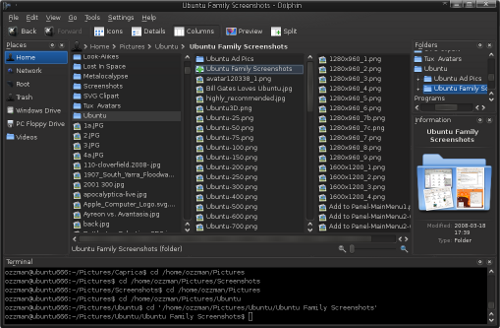 The views are “Icons“ (like the same in Nautilus, but smaller, and just the icon, no preview), “Details“ (your standard row-by-row format with information next to each file), “Columns“ (starts off with 2 columns, and every sub-folder you click on opens another), “Preview“ (turns your icons into thumbnails, and folders will show previews of pics inside), and “Split“ (gives you 2 columns you can browse with). When you are in “Split“ mode, you can look at the beginning and end of a large folder at the same time, or use the second column to browse another folder or drive. The “Columns“ mode offers another interesting and useful way of browsing, so you certainly have a few choices in ways to browse. Some things to note are that with Dolphin, like other KDE file managers, the default is to treat a single-click as a double-click. This can confuse Gnome users, as even slowly clicking a file will open it. All you need to do to select a file is click the green + that appears in the top left corner when you hover your cursor, and it will select it. But if you’re selecting a file simply to know the filesize, like you would in Nautilus, then you don’t need to, as that information will appear in the status bar and the Information pane simply by hovering your cursor over the file. Not only that, but if you are in “Icons“ view, hovering over picture files will show the preview in the Information pane. In “Preview“ mode, another nice feature is that when you hover your mouse cursor over a folder, its preview thumbnail will cycle through other pictures in the folder (which you can see in the second pic, as the selected folder looks different from the preview in the Information pane). So there are some great reasons to try out Dolphin. There’s a lot more you can do to customise its interface, and if the single-click/double-click issue ends up annoying you, then don’t worry, you can change the setting to what you’re used to. You can change that and other default settings via Settings > Configure Dolphin. Can I Run KDE Programs in Ubuntu’s Gnome? When looking around for more programs to install, you may hear of great KDE (K Desktop Environment) apps, and be wondering if you need to be running Kubuntu to use them. The answer is that while these apps do indeed need parts of KDE to function, those dependencies can be automatically fulfilled via your package manager, Synaptic. So you need not have installed KDE as a backup desktop environment, as those programs will just install needed KDE libraries and programs/commands they depend on. Or more accurately, Synaptic will take care of that. And don’t worry about KDE system files interfering with Gnome, as they are quite separate, and they will only ever be called upon by those KDE programs when needed. As you’ll note in Synaptic, those programs will be listed as KDE apps, but nonetheless can be installed into Gnome. And they’re easy to find, as the majority actually start with K. So don’t be shy to try a few out, as some will be so good they’ll replace apps you currently use, and others will end your search for an app for a particular task. Just note that occasionally there might be a few minor issues, like parts of programs not displaying properly, but these can be easily resolved. The 4.x incarnation of KDE is still pretty much in its infancy, so there are still bugs to be ironed out, especially when it comes to running them in Ubuntu‘s default desktop environment, Gnome. I’ve noticed bits and pieces of programs don’t always display properly, like when I click on an alarm task in KAlarm to edit it. Basically, the box pops up, but all I can see is the charcoal KDE4 background, and clicking around in it does nothing. But I found if I maximise it, suddenly everything appears, then I can then restore the dialogue box to its proper size (not that I really need to), and then proceed with the task. So if you get the same thing happening with a KDE4 app in Gnome, try maximising it to see if it makes a difference.